First, the firing was across the river, and for an hour or two the action was more amusing than any thing else, the guns of Alexander playing upon the Rebel line with no apparent effect, and the Rebel guns on at least two batteries certainly doing no execution on us. The turnpike bridge we held firmly until one o’clock, handsomely repulsing several desperate charges to take in on the part of the enemy, in which they suffered severely each time, but Gen. WaIlace doubting his ability to hold it longer; at about four o’clock, ordered it fired; and in a few moments it was a sheet of flames. In the meantime the brigade of Gen. Tyler successfully repulsed all attempts of the enemy on the rail-road bridge and during the same hour, higher on the river, on the Baltimore pike, the 144th and 149th Ohio were holding the enemy at bay at the stone bridge by which that pike crosses the Monocacy. Thus, for three hours and a half, the line of Monocacy was held against the successive assaults of an enemy at least twice our strength and affairs had by no means an unprosperous look. But the character of the Monocacy was fatal to us. Two miles below the covered bridge of the Washington turnpike the stream is only middle deep and easily approached on either side. Still hammering steadily on our front the enemy dispatched six regiments to this point and this force crossing here and falling suddenly and heavily on our left flank. The state of the little force of General Wallace was heated. But nevertheless it fought with a spirit and determination worthy of a chance of victory. During the few minutes the battle lasted after the attack on our flank occurred the most of our losses. Colonel Seward, the gallant commander of the Ninth New York Heavily Artillery went down severely wounded but was borne from the field, Lieutenant-Colonel Taft of the regiment was wounded. Captain King, General Ricketts, Adjutant-General, and Adjutant General of the First Brigade, both were born off dangerously hurt, and General Tyler carried off a prisoner. A fire heavy enough to cause such a loss of officers in so small a force could not long be withstood. Our line was doubled up on itself like the shutting of the blade of a jack-knife. In some little confusion it was pressed back over the railroad and thence we fell back directly across the country to the Baltimore pike, which we reached two miles this side of New Market. Captain Alexander brought off all his guns. On reaching the Baltimore pike our retreating column was joined by that portion of our force which had, during the battle been holding the approaches from Frederick. At Stone Bridge the 144th and 146th Ohio had been compelled to give way, but not until they had there silenced forever the slander that some hundred day men won't fight. These two regiments stood to their posts like veterans and their thinned ranks bear sorrowful testimony to their devotion. The battle of Monocacy at all is a question often asked on the streets of this city and variously answered. All admit that it was a defeat; that our losses were heavy, probably one thousand killed, wounded and missing, which is a frightfully large per cent of those engaged, and that after the developments of Friday afternoon such a result might have been expected. Thee answer to all these queries is that in the first place General Wallace was imperatively order to hold Monocacy Bridge and to have given it up without a fight for it would have been disobeying orders. And even if he had no such orders, sound policy demanded a fight. Until the action commenced, in fact, not until it was over, was it definitively ascertained what force the enemy had in hand. Rumors, wild and improbable Sinbadian tales, on both extremes now of no rebels at all but a few horse thieves and then of Xerxesian kests, had been the current stock of information on the subject of the enemy’s strength, until the battle of Monocacy in part at least developed it. We know now that fifteen thousand men are operating here, for that number we certainly saw and felt on Sunday. 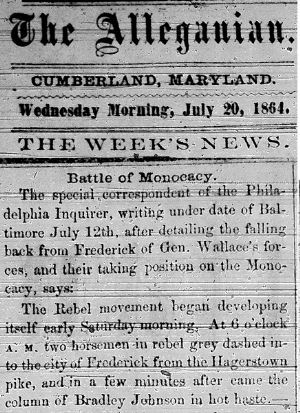 How many more there are we cannot say, but the battle of Monocacy told us there are that many, and the information is almost worth the defeat. Our retreat, after we reached the Baltimore pike Saturday evening, was orderly and leisurely and, after the first three or four miles it were accomplished, unmolested by the enemy.